What an adorable dress by Claire & Charlie for the fall and Thanksgiving holiday! 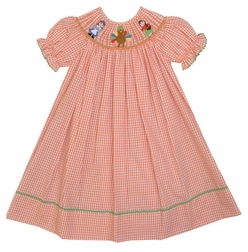 It is made with orange gingham and is trimmed with lime green ric rac. 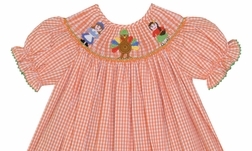 The smocking at the neck is hand embroidered with a girl pilgrim, girl indian and a precious turkey who is actually crocheted!